The libertarian Iceland Watch has posted quite a remarkable ad in Icelandic media insinuating serious corruption by a named individual at the Central Bank of Iceland with a large photo of the governor of the Central Bank Már Guðmundsson. If the four largest offshore króna holders, on whose behalf Iceland Watch seems to be campaigning, think they are winning friends in Iceland with these serious and unfounded insinuations, they should think again: the few who seem to notice it ridicule it or find it hugely upsetting. Iceland Watch, earlier fighting Obama care and now fighting for the cause of the offshore króna holders that feel they have been wronged by the Icelandic government and the Central Bank of Iceland, CBI, has topped its earlier ads. It is now directly addressing Icelandic voters, claiming they are losing out due to the bad policies and corruption at the CBI. Whereas earlier ad was placed in media in Iceland, Denmark and the US, the latest one has, as far as I can see, only been posted in Iceland. The four funds holding offshore króna are Eaton Vance, Autonomy Capital, Loomis Sayles and Discovery Capital Management. So what is the Iceland Watch message, accompanied by a photo of CBI governor Már Guðmundsson, to Icelandic voters? This costs each Icelandic citizen between 15.000 and 27.000 US dollars annually. We have now discovered that Sturla Pálsson, a highly placed individual at the Central Bank of Iceland, is being investigated in-house for alleged insider information. The investigation of Sturla Pálsson should focus on answering some key questions: Did Sturla Pálsson use his knowledge of the recently announced legislation on capital control that discriminate foreign investors in carrying out insider trading? Sturla Pálsson answers directly to governor Már Guðmundsson and is believed to have had access to all this information. Media in Iceland should be asking these questions. Corruption is not an unknown theme in Icelandic politics but it will come as a surprise to most Icelanders that Icelandic officials are acting in a corrupt way to punish the four foreign funds holding offshore króna. We should keep in mind that the International Monetary Fund has followed and scrutinised policies in Iceland since October 2008. The policy that’s such a thorn in the side of the four funds that they are willing to go to these lengths in advertising their pain internationally has also been passed with full acceptance of the IMF. Yes, the IMF isn’t infallible and perhaps the EFTA Surveillance Agency will indeed find Iceland at fault. But to think that the measures in summer came about because of corruption in Iceland seems pretty far-fetched. Shouting it from the roof tops won’t add to the arguments the funds have presented with the ESA and possibly in courts. Saying that only domestic investors can invest in Iceland isn’t correct. This does no doubt refer to measures re offshore króna holders but it’s not a correct presentation. Why doesn’t the Iceland Watch quote the UK research? As far as I know it comes from the Legatum Institute, connected to the Dubai-based Legatum Group established in 2006 by Christopher Chandler. The Legatum Institute recently had a discussion on Iceland and capital controls and has also published research of capital controls and anti-competitive policies. What is wholly missing is how the easing of capital controls has been done; it only focuses on the perceived harm caused by the most recent measures that has so upset the four funds. Eh, creating 30.000 jobs in an economy with close to full employment in a country of 332.000 that needs to import people to fill jobs? And let’s put the figures in context: $5bn to $9bn amounts to 25-40% of Icelandic GDP. Is it credible that these latest measures hurting the four funds are really costing the Icelandic economy these sums annually? Intelligent readers can figure out the answers on their own. If Iceland Watch intended to clarify to Icelanders the enormous losses they are suffering it would have helped to publish these losses in Icelandic króna, not in US dollars. It will be news to Icelanders that the CBI is investigating Sturla Pálsson for using his knowledge of the recent measures for his own gain via insider trading. Again, this is a statement with no verification. Given that the Icelandic media mostly ignores the ad and the reaction in Iceland is not to take this seriously at all it’s not certain that the CBI will see any reason to answer. Pálsson has however recently been named in the Icelandic media related to breach of trust over the weekend October 4 to 5 2008: he told his wife, who was at the time the legal council at the Icelandic Banking Association (and is in addition closely related to Bjarni Benediktsson leader of the Independence Party and minister of finance) of the imminent Emergency Act. – The Iceland Watch allegation could possibly be a misunderstood echo of this recent reporting in the Icelandic media or indeed a new and much more serious allegation, unknown in Iceland. I’ve earlier expressed surprise that the funds think they are gaining friends and influence in Iceland through their alliance with Iceland Watch. This latest ad, apparently only directed at Icelanders, indicates a profound lack of understanding of the country they are trying to influence (tough I can’t imagine this approach will indeed work anywhere). The photo of the ad above is my screenshot of a post on Facebook by minister of foreign affairs Lilja D. Alfreðsdóttir. 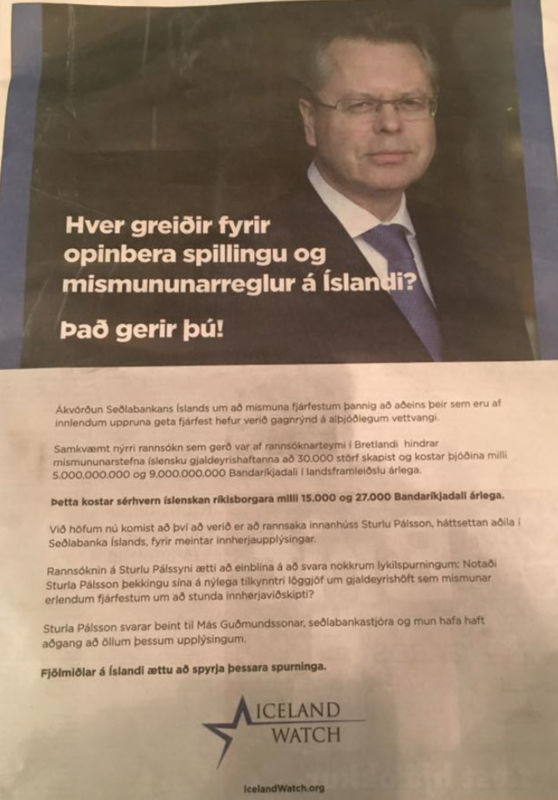 Her comment to the ad is: “This attack on Icelandic interests is intolerable and what’s the aim of those behind it?” There are only few comments to the ad but some mention that this will hardly help the cause of those sponsoring it. The ad is now also on the Iceland Watch website in English. The translation above is my translation as it gives some sense of what it looks like in Icelandic. The story is that this remarkable ad addressed to Icelandic voters is written in a version of Icelandic that resembles a Google translate text. Given that Icelanders are often quite pedantic about their language this will hardly induce Icelanders to take the ad seriously. Or as it says in one comment on Alfreðsdóttir’s Facebook page the ad is “a crime against the Icelandic language” – and that’s a serious offence in Iceland. Updated: I’ve been made aware that Loomis Sayles is not at all involved in the Iceland Watch campaign against Iceland. I’m sorry that my earlier information here was not correct. Subscribe to comments with RSS or TrackBack to 'A weird ad in bad Icelandic against the Central Bank of Iceland'. Saw this article from a Bloomberg article about Alex K Glassman a lobbyist/astroturfer at DCI Group in D.C., U.S.A. Fake grass roots. An inflatable rat. Testimony with hidden ties. Billionaires are using DCI Group to make their bets pay off—while keeping the public in the dark.